6657 TWO DEATHS (2007) Director. 3946 WITHOUT YOU I'M NOTHING (2007) Director. 3129 THE WITCHES (1990) Director. 2179 TRACK 29 (1988) Director. 7110 THE MAN WHO FELL TO EARTH (1976) Director. 219 DON'T LOOK NOW (1973) Director. 303 BAD TIMING (1973) Director. 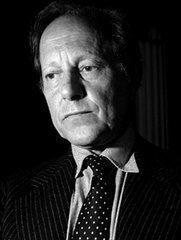 Nicolas Roeg entered the industry in the late 1940s, becoming a camera operator. In the early 1960s, he graduated to director of photography and, in this capacity, worked with Richard Lester (Petulia), Francois Truffaut (Fahrenheit 451), and Roger Corman (Masque of the Red Death). He started a second career as director in the late 1960s and in the early 1970s sharing directorial credit with Donald Cammell he made Performance. Shortly after he directed the superb Don't Look Now. Another notable film from around this period was the 1976 film The Man Who Fell To Earth. Also like Russell, Roeg is known for his striking visual and experimental cinematic style. Nicolas Roeg's wife is actress Theresa Russell, who has starred in a number of her husband's films.